The workshop will focus on the future character, density and open space within the study area. 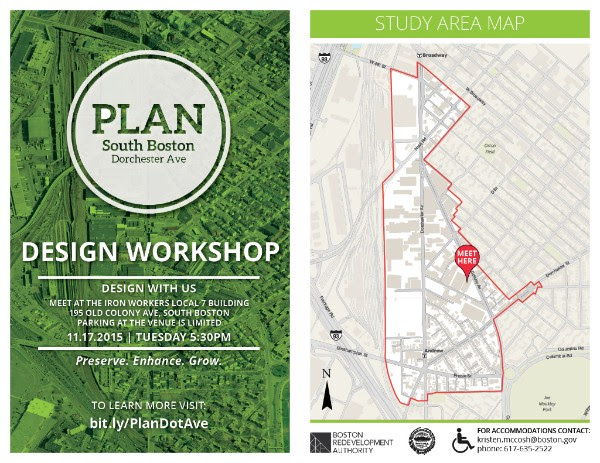 This workshop is the fifth and final workshop in this phase of public planning meetings for the Dorchester Avenue corridor in South Boston. A Dot Ave. Design Recap Session & Dialogue will be held on Monday, December 14th at 6PM at the same meeting location. There will be also be a conversation about the elements and components of a draft plan. More details on the Dot Ave Corridor Plan.